I've been reading a bit about photography, and discovered this thing called "photo stacking". It helps you create super close ups that have everything in focus. Normally in a photo, you get some bits in focus, and some out of focus. This can be a good thing, because you don't always want, for example, the background to be sharp. Sometimes things look better when you cant see them. But sometimes you want to see it all. I'll drop a series of seven photos here with each one seeing a different section in focus. 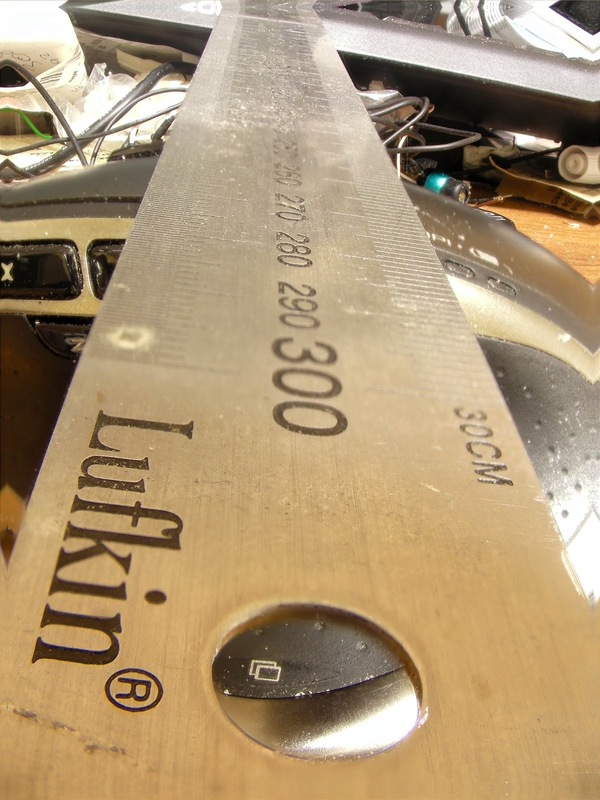 This first pic of a 300mm ruler is taken at a focal length of 10mm. You can see that the section that's in focus has moved a little further back. Here are three more in the series with each one seeing the focal length change through 100mm, 150mm, 200mm, and 300mm. I would have preferred to use increments of 5mm all the way through, and take 60 photos, but this camera I have only deals with those photo lengths when used in manual focus mode. There is software that is free and open source, that can take the best bits of each photo, and knit them all together to make one photo. Apparently it's possible to do this in a graphics program, but I dont have the skill set, and the software seems to work. There are a few different software packages, some that cost and some that are free. The one I'm playing with is called, CombineZP. All you have to do is select the photos (New), then chose something that I dont understand called, "align and balance used fra..." (the title of this function is cut off because whoever made it doesn't respect my inalienable right to resize whatever window I want, and my screen size isn't the same as theirs), then click something that makes perfect sence that says GO. After a few seconds wait, the end result is pretty good for a first attempt, and might just prove to be a very useful tool in trying to capture extreme close up shots. I'm guessing it would be perfect if I just had a camera that could deal with letting me chose where to focus all on my own. Even without respecting my free will, the result is quite good. You can see in the photo below, some bands of blur where I couldn't divide the focal length and add another frame. There's an obvious blur between the "k" and "i", and another at the "3" in 300. Another at 250, but they are all errors caused by my camera not letting me take pictures in between the ones I took. 'Tis an interesting bit of kit, and I thoroughly recommend trying it if you are taking macro shots. 120 Things in 20 years - I love discovering new things like photo stacking for macro shots, and I love discovering that there are only 6 photos in my series of 7. I deleted one, and have no idea which one it was, so I moved on. I'm also without confidence that I'm using the words "focal length" properly.